One of Britain's strangest UFO flaps occurred on the Welsh coast in 1977. It has been known by various names, including the Dyfed Enigma, the Welsh Triangle case, or the Broad Haven UFO. The story begins with a group of schoolchildren. On February 5 a group of schoolchildren in Broad Haven ran excitedly into their school and told their teacher that they had seen a silver-suited spaceman coming out of a spaceship. Perhaps not surprisingly, their teacher didn't believe them and carried on with the lessons as normal. On getting out of school, however, they claimed they saw the spaceship again. They told friends, parents and everyone they could think of, but no one in the grown-up world would take them seriously. The next day, so miffed were they by this inattention, that they handed in a petition to the police, demanding the incident be investigated properly. All the fuss caused the headmaster to take the UFO sighting a little more seriously than he had before. He gathered all the children involved in the incident together and asked them to draw what they had seen. The drawings that resulted were highly consistent, showing a saucer-shaped UFO with a dome on top. This first sighting heralded an extraordinary year of unusual happenings in Wales. As it unfolded, vast numbers of people claimed to see UFOs or to have bizarre, paranormal experiences of other kinds. Some sceptics have claimed that the entire Broad Haven UFO flap was caused by hoaxers. It was noted that silver suits, somewhat resembling those described by the eye-witnesses, were in use at a nearby oil refinery. 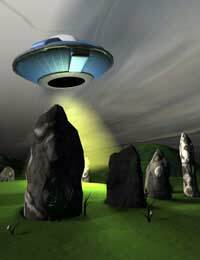 As happens in almost cases of persistent UFO activity in a specific area, hoaxing does soon enter the picture. Local yahoos see it as a great opportunity to have some fun. The Welsh Triangle flap was no exception. Indeed, some of the hoaxers have now come forward and admitted it publicly. The temptation is to dismiss all of the incidents because of a few fake ones. It's difficult to see how hoaxers could account for all of the flying objects that were sighted, however, so fakery cannot provide a complete explanation for events in the Broad Haven area as a whole. Hi bigmac58, Do you have any more information about this incident in Cheadle in 1966 that you can share? Has it been investigated? Any references to it in articles, books, web sites etc? Cheers, Shane. These spaceships were also seen in Cheadle Cheshire In June 1966 on the school field and again 24 years later on the same field. The figures were taller than the saucer shape device. These were seen by children and teachers but no one was allowed to discuss it, the head closed the school blaming the faulty drains! Plenty more must have seen these entities and were afraid to say anything.